Natalie is exactly 4 months old today. Happy 4-month birthday, baby! Below are some recent photos. Also, check out video 35 of Natalie licking her lips. She does this all the time now. We think she may be teething and "itching" her lower gums with her tongue. And video 36 of Natalie rolling over and enjoying tummy time. Cutie patootie wearing her cute golf shirt-dress. Natalie wearing a new "real girl" outfit (tank and white shorts). Totally beats wearing her usual one-piece baby PJs. 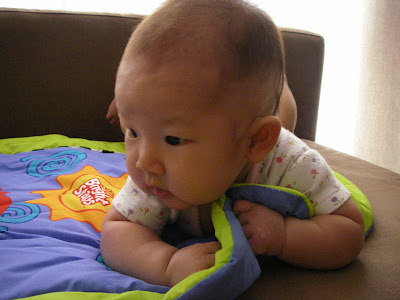 Natalie enjoying tummy time on her new playmat.